Today I decided to shoot a bowl of colorful jelly beans. Mmm…jelly beans. So sweet and tasty. OK, now that we have that out of the way let’s get to how I set this shot up. Step 1: Obtain jelly beans. I got mine in the bulk section of Market of Choice but seriously you can get jelly beans just about anywhere. Step 2: Setup the area where I would shoot the photo. I used the back of a speaker box as my base and taped a sheet of heavy white paper on a wall so it hung down and then rolled out onto the speaker box. This gave me a seamless white background. Step 3: Setting up the lighting and camera. I used 2 flashes for this shot. I had a bare Canon 430EXII directly camera left that was directed at the background to keep the lighting fairly even. I also had a Canon 580EXII with a Lumiquest Softbox III to provide even and diffuse lighting on the subject. The camera was on a tripod and setup with a wireless remote trigger as well as a Cactus V4 transmitter to trigger the flashes. Step 4: Take a few test shots and get the lighting and exposure correct. For this shot I ended up with the following settings: Canon 5DII | Tamron 28-75 | f/14 | 1/125th sec. | ISO 200. 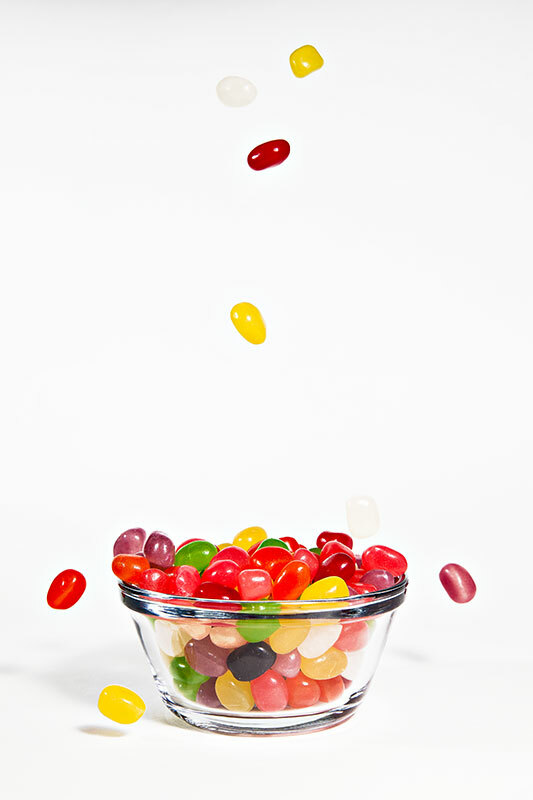 I also set the drive mode to continuous shooting so that I could take continuous shots as the jelly beans began to fall. Step 5: Start shooting. Using my remote trigger I dropped a handful of jelly beans into the partially filled bowl and triggered the shutter which continuously shot as I continued to drop jelly beans. I shot almost 200 images to get this final shot. I think if I do this again I will rig up a system to drop the jelly beans and probably drop a larger quantity. While I like this final shot I want to see what it would look like with a larger stream of jelly beans cascading down from above. Step 6: Clean up all the jelly beans that have now bounced all around the room by eating them. It turned into a sweet shoot. In the future I am going to try and take a photo of the setup that I use and post that along with the final image so that you can see exactly how images like this are made. Sometimes they involve quite a bit of prep before the actual shooting starts. Great shot and totally delicious photo! And what a colorful picture! I’m continually amazed by your creativity in taking normal household items and making them into great pictures. It is an art. And one at which you are certainly adept. Keep up the good shooting sessions Matt! @Tracker – Thanks!! This was a good first try. I’ve got plans to reshoot this one from different perspectives as well. I think it would also be interesting to shoot it from above.